Here are the ten most popular news articles, week ending 19th March 2017, covering catastrophe bonds, ILS, reinsurance capital and related risk transfer topics. To ensure you never miss a thing subscribe to the weekly Artemis email newsletter updates. Demand for reinsurance capacity has increased at the latest January 1st renewal season, but the much discussed pricing floor has yet to become evident, as steady and continued reinsurance price declines at upcoming renewals are forecast by some of the market. According to a report from Reuters, the Mexican government is planning to sponsor another catastrophe bond and is currently seeking bids from companies that can help to facilitate the issuance of a three-year cat bond covering hurricane and earthquake risks. At the end of 2016 total return reinsurance vehicle KaylaRe Ltd., launched by Enstar, Hillhouse Capital Management, and Stone Point Capital recently, already had $350 million of investments in a fund managed by Hillshouse, thanks to reinsurance transactions with Enstar subsidiaries. AXIS Capital Holdings Limited, the Bermuda domiciled insurance and reinsurance group, ceded $40 million of premiums and $10 million of losses to its Ventures Re, third-party capital reinsurance unit which is backed by investors. The Federal Emergency Management Agency (FEMA) will seek to build on its “cornerstone” flood reinsurance placement in order to better protect the National Flood Insurance Program (NFIP), while shifting more of its risk to the private sector. As readers and the ILS market will now be aware, U.S. primary insurance group Allstate is back with a new $300 million Sanders Re Ltd. (Series 2017-1) catastrophe bond , targeting capital markets-backed U.S. multi-peril collateralised reinsurance capacity. Global reinsurance firm Munich Re has expanded its third-party capital ILS investor base in its collateralised sidecar and catastrophe bond issues, while also expanding the coverage of its Eden Re II sidecar to include four lines of business. Nephila Capital’s syndicate 2357 at Lloyd’s of London began to pick up risks through the State National program business arrangement in 2016, as the largest manager of reinsurance linked assets switched away from one of its collateralised vehicles as the program grew. Securis Investment Partners has become the first insurance-linked securities (ILS) focused investment manager to license the RMS Exposure Manager solution, the firms have announced. The extension of maturity for the stricken Gator Re Ltd. catastrophe bond transaction has been extended even further, we understand, as the time to clarify the full loss and pay out due to sponsor American Strategic Insurance increases. This is by no means every article published on Artemis during the last week, just the most popular, some of which were published over a week ago. There were 24 new articles published in the last week. To ensure you always stay up to date with Artemis and never miss a story subscribe to our weekly email newsletter which is delivered every Wednesday. View the current breakdown of the market in our range of charts, allowing you to analyse the cat bond market. 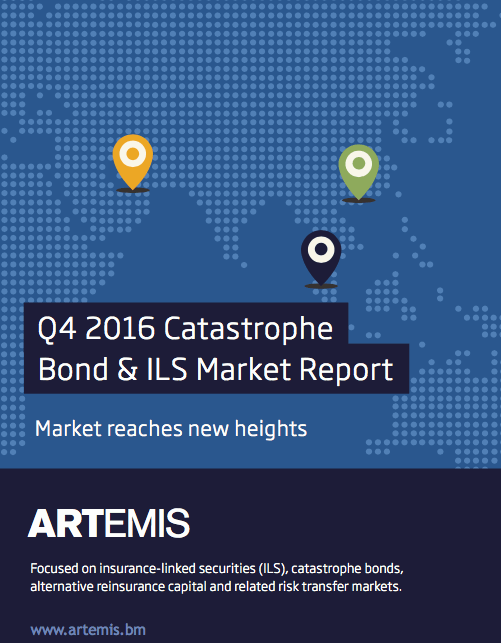 We’ve now published our Q4 2016 catastrophe bond & ILS market report. This report reviews the catastrophe bond and insurance-linked securities (ILS) market at the end of the fourth-quarter of 2016, looking at the new risk capital issued and the composition of transactions completed during Q4 2016. Q4 saw $2.13 billion of risk capital issued from six transactions, exceeding the ten-year average for the quarter by approximately $337 million. Strong investor and sponsor appetite throughout 2016 helped the market end the year at a new record size, of $26.82 billion.